In the heart of Penang Island’s vibrant capital, the Bayview Hotel Georgetown Penang combines contemporary style with an enviable central setting. You can relax in one of 340 tastefully appointed rooms and suites, and host distinguished events in sophisticated boardrooms and an elegant ballroom. The open-air Sky Bar is the perfect place to sip a cocktail as you take in panoramic rooftop views from one of the best nightspots in Penang. The hotel is ideally set for business or leisure. 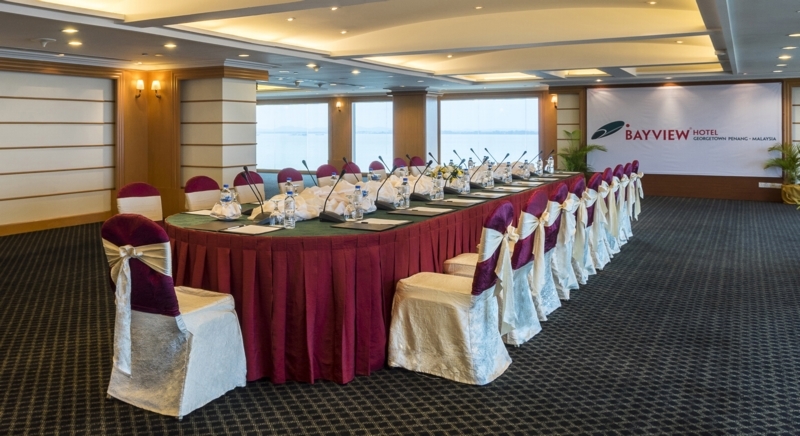 Our extensive meeting and events facilities are complemented by high-tech equipment and free WiFi throughout. The Lobby Lounge serves drinks and snacks by day, while in the evening it’s the place to enjoy live music over crafted cocktails or a chilled glass of wine. Airy Kopitiam serves local specialities like classic Malay fish curries, as well as signature Western cuisine. In the rooftop Three Sixty Revolving Restaurant, you can savour an international buffet every evening while enjoying views across Georgetown and the Straits of Malacca.